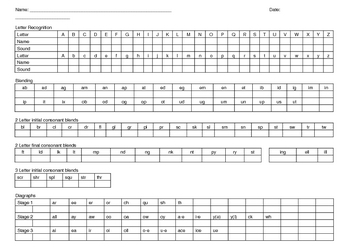 I used this page as a guideline to help keep track of what letters and sounds my students understood. Using one on one teacher/student time, I simply asked the child the letter/sound and ticked the apropriate box if they got it correct. It was also a great tool to keep in their files and pull out to show parents. If I ran out of time, it was easy enough for teacher aides to follow and assist with. I have purposely left it as a Word Document so you can add/delete/change the letters and sounds you are focusing on.